One summer's day, a dying stranger carrying great wealth in gold comes to the settlement of Ratharryn. The three sons of Ratharryn's chief each perceive the great gift in a different way. The eldest, Lengar, the warrior, harnesses his murderous ambition to be a ruler and take great power for his tribe. Camaban becomes a great visionary and feared wise man, and it is his vision that will force the youngest brother, Saban, to create the great temple on the green hill where the gods will appear on earth. Saban' s love for Aurenna, the sun bride whose destiny is to die for the gods, finally brings the rivalries of the brothers to a head. But it is also his skills that will build the vast temple, a place for the gods, certainly, but also a place that will confirm for ever the supreme power of the tribe that built it. 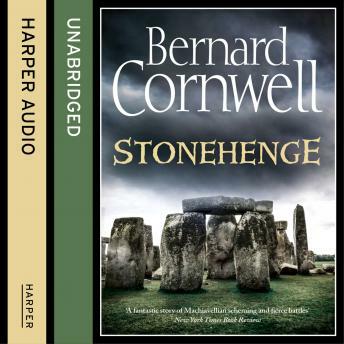 Stonehenge is first and foremost a great historical novel. Bernard Cornwell is well known and admired for the realism and imagination with which he brings earlier worlds to life. And here he uses all these skills to recreate the world of primitive Britain and to solve the mysteries of who built Stonehenge, how and why.